Download "Voice Internet Phone Gateway"
5 # The numbers 2834 in this string are the web based management password # Restarts. (The system should be restarted immediately) 9. Hang up the phone 2. 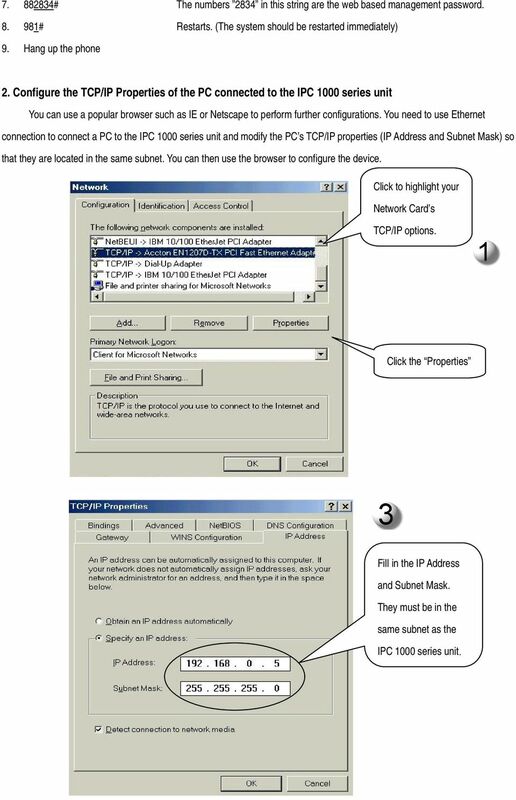 Configure the TCP/IP Properties of the PC connected to the IPC 1000 series unit You can use a popular browser such as IE or Netscape to perform further configurations. 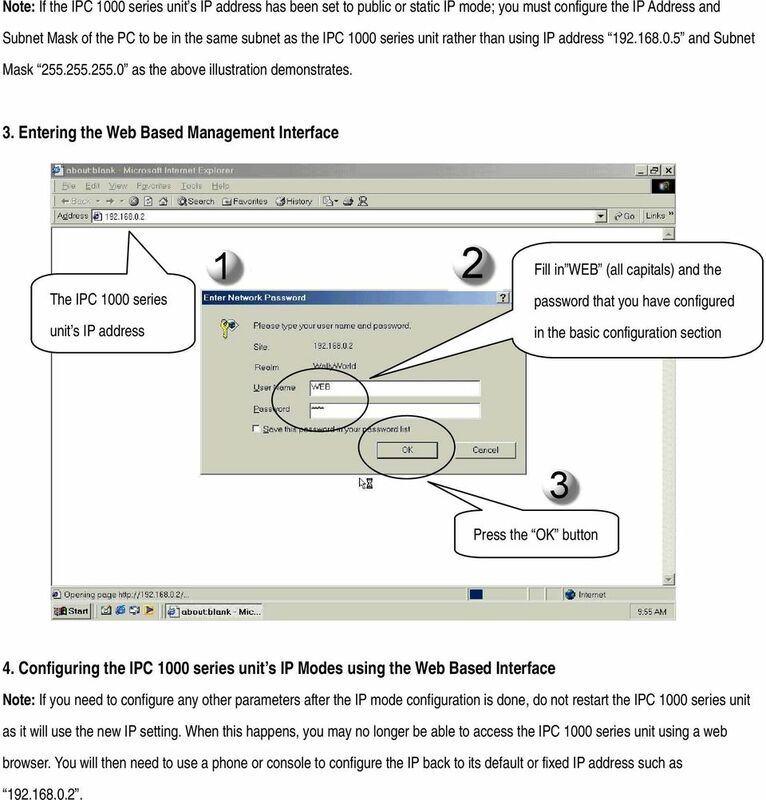 You need to use Ethernet connection to connect a PC to the IPC 1000 series unit and modify the PC s TCP/IP properties (IP Address and Subnet Mask) so that they are located in the same subnet. You can then use the browser to configure the device. Click to highlight your Network Card s TCP/IP options. Click the Properties Fill in the IP Address and Subnet Mask. They must be in the same subnet as the IPC 1000 series unit. 7 1. Select BASIC Button. 2. Select PPPoE 4. Click the Apply button to apply any 3. 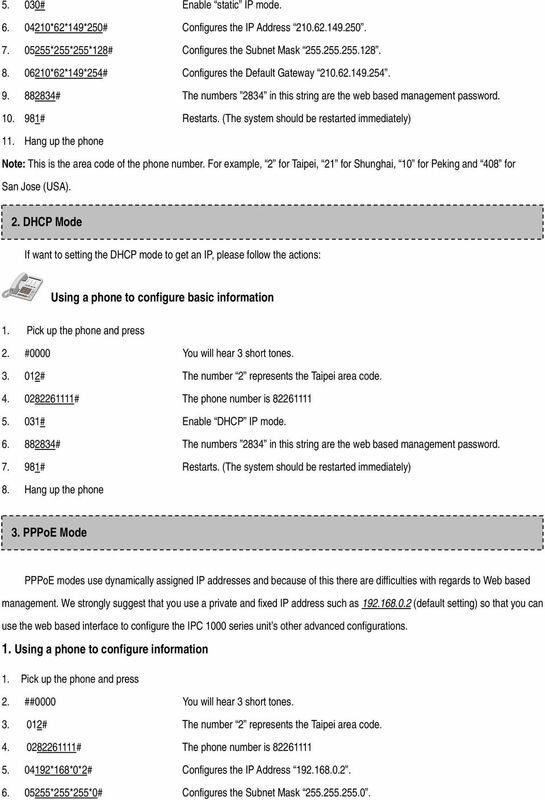 Enter the PPPoE information. Fill in the (PPPoE) account username and password, re-enter the password to confirm 10. 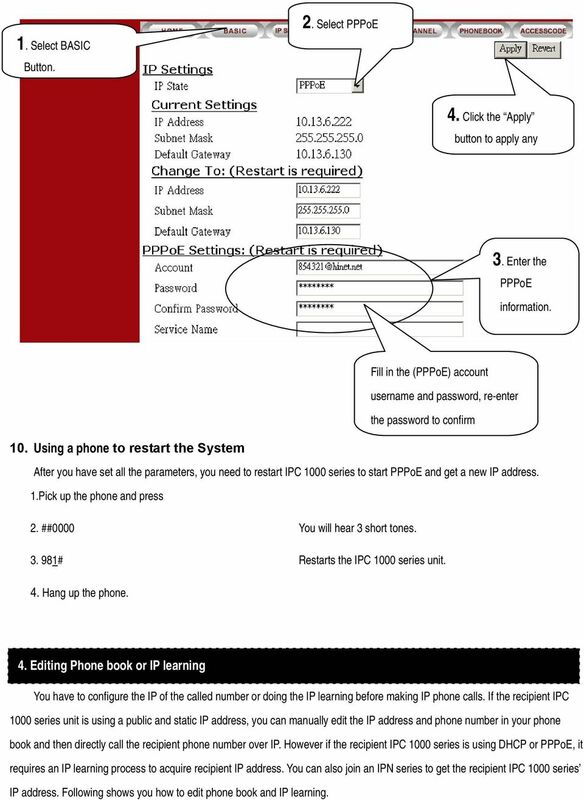 Using a phone to restart the System After you have set all the parameters, you need to restart IPC 1000 series to start PPPoE and get a new IP address. 1.Pick up the phone and press 2. ##0000 You will hear 3 short tones # Restarts the IPC 1000 series unit. 4. Hang up the phone. 4. 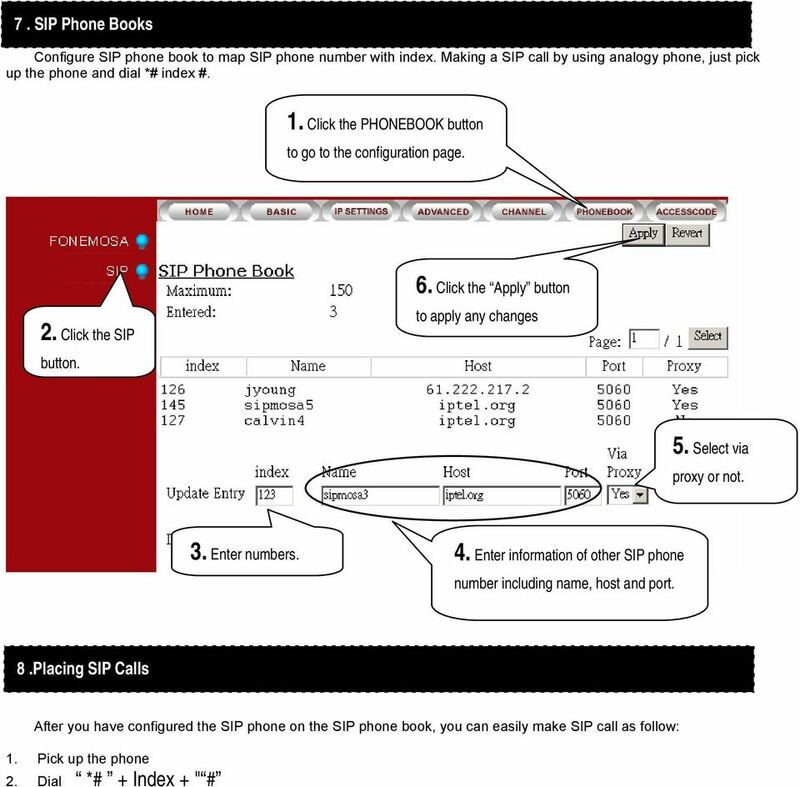 Editing Phone book or IP learning You have to configure the IP of the called number or doing the IP learning before making IP phone calls. 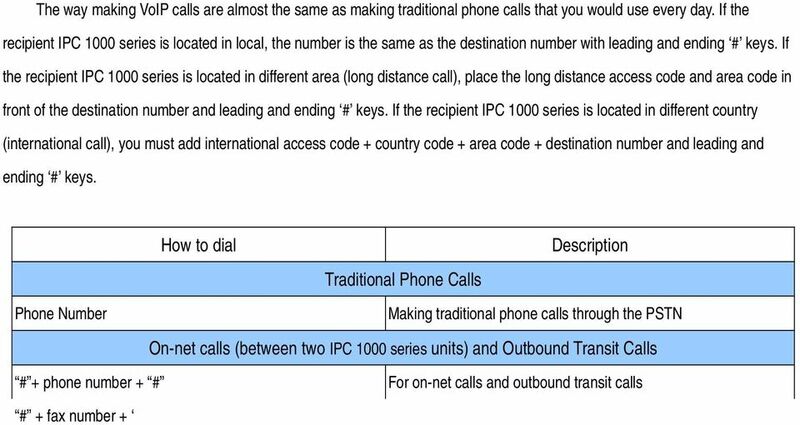 If the recipient IPC 1000 series unit is using a public and static IP address, you can manually edit the IP address and phone number in your phone book and then directly call the recipient phone number over IP. However if the recipient IPC 1000 series is using DHCP or PPPoE, it requires an IP learning process to acquire recipient IP address. You can also join an IPN series to get the recipient IPC 1000 series IP address. Following shows you how to edit phone book and IP learning. 8 Editing Phone Book 1. Click the PHONEBOOK button to go to the phonebook configuration page. 2. Fill in the country code, area code and phone number 5. Click the Apply button to apply any changes 3. Fill in the IP address 4. Fill in the signaling UDP port. 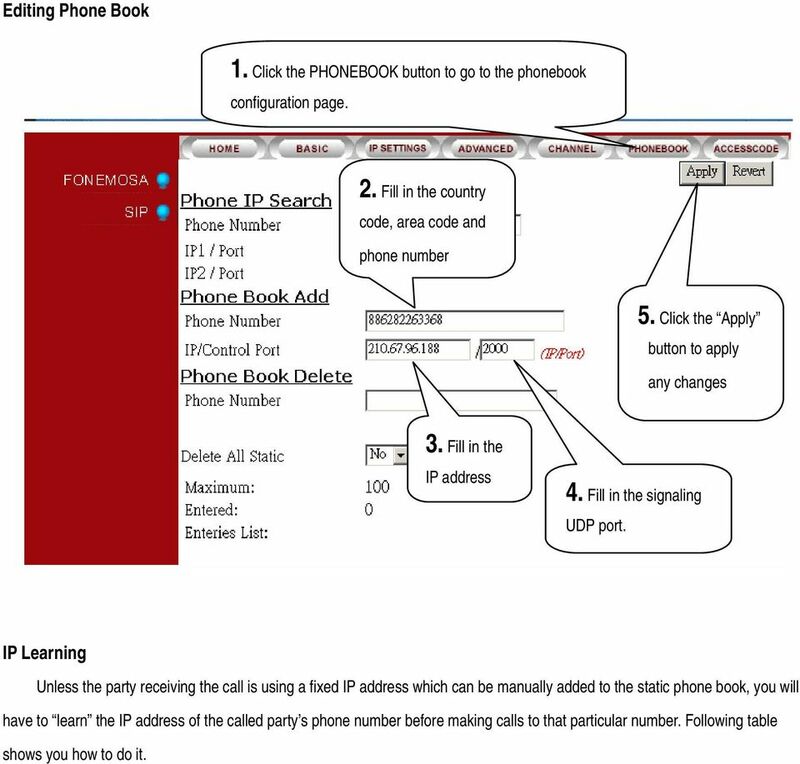 IP Learning Unless the party receiving the call is using a fixed IP address which can be manually added to the static phone book, you will have to learn the IP address of the called party s phone number before making calls to that particular number. Following table shows you how to do it. 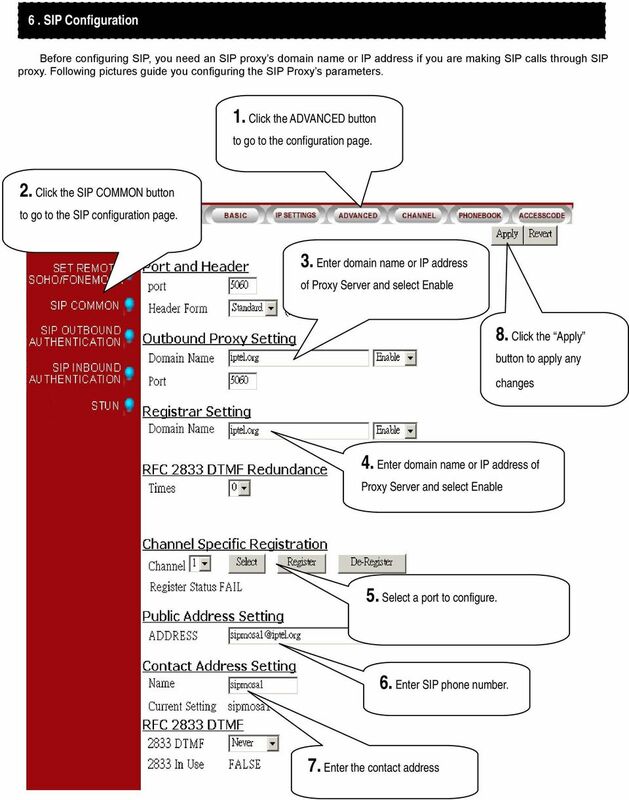 12 Configure outbound authentication if SIP proxy server or other SIP phone request for authentication. 1. Click the ADVANCED button to go to the configuration page. 2. Click the SIP OUTBOUND 4. Click the Apply button to apply any changes 3. Enter information for authentication including realm, username, port and password. 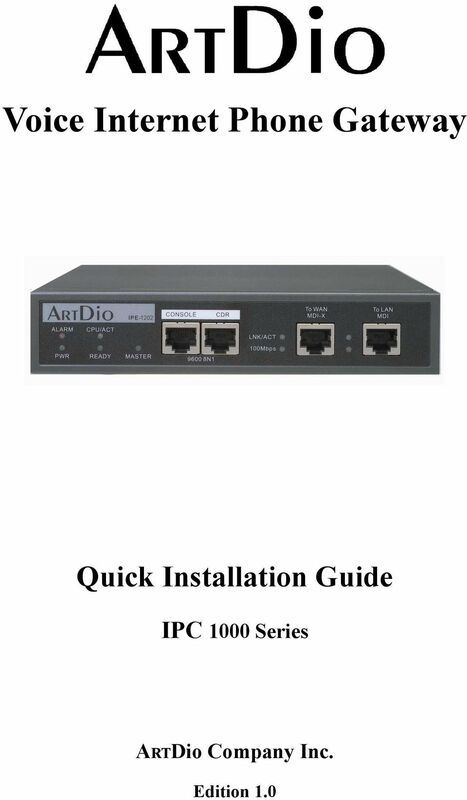 LevelOne VOI-9000 H.323 VoIP Gatekeeper User Manual Quick Guide Step 1: Broadband (ADSL/Cable Modem) Connections For VOI-9000 A. Connect VOI-9000 RJ45 LAN port to Router/ADSL as one of the following connections. Quick Start Guide v1.0 Table of contents : 01. Quick Start Guide...03 O2. Configuring your VoIPOffice appliance...14 03. Adding a VoIPtalk trunk...21 04. Configuring UADs for use with VoIPOffice...25 05. Release Notes for NeoGate TA410/TA810 41.18.0.X ===Firmware Version: V41.18.0.11==== Applicable Model: NeoGate TA410/TA810 Release Date: January 15th, 2015 http://www.yeastar.com1/6 1. New Features 1. 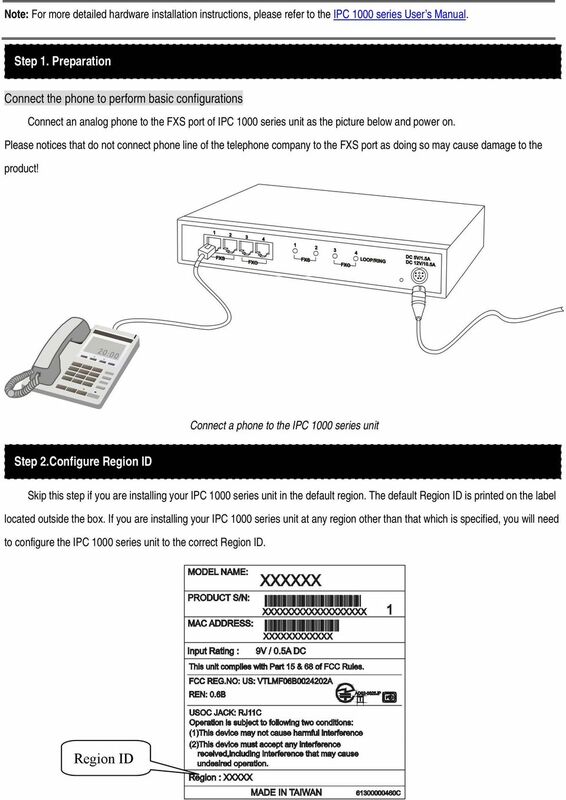 IP Telephony System User Guide Voice Model No. SPA9000 Copyright and Trademarks Specifications are subject to change without notice. Linksys is a registered trademark or trademark of Cisco Systems, Inc. Note: these functions are available if service provider supports them.